Well we've passed the half-way mark in Nicky and Mike's 30 Days of Writing II Minus 2. Now that's such a mouthful I've taken to calling this month of torture 30DW2-2. Sorta sounds like a motor oil, I know. Kinda like better living through higher viscosity. Anyway, on to today's prompt...or else. Ha, ha. See what I just did there. Or else Nicky'll come after me waving her fresh baguettes (is that a euphemism?) and tossing a couple of wheels of Oka cheese. Now here's a little tale that rings true. We have a phantom doorbell. A few years back I bought one of those battery-powered doorbells to replace one that didn't work. You know, one that works on some kind of radio frequency. It was great. Put a little battery in the button and a couple of big ones in the bell and...voila...we had a working doorbell. When the time comes to replace the note on the door because the weather has worn away the writing I really can't make up my mind on what kind of note to post. I'm kinda leaning towards the latter. It has a certain ring to it, don't you think? Now if you're just knockin' about get yourself over to Nicky and Mike's place at We Work For Baguettes and Oka cheese and check out what those other idiots have come up with today...or else. I like the last note. 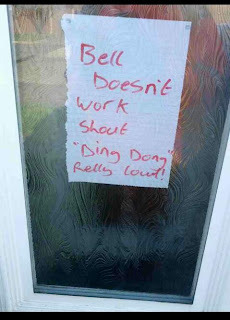 I'd do that...but no one ever rings my broken doorbell - so it would be a waste of paper. How do you know they never ring it, if it's broken? Definitely the latter! In fact, I'm going to put up a note like that myself, even though my doorbell works just fine. I vote for the 2nd one, too. You are rockin' these prompts. Oh, yeah, that was a bit of a bummer wasn't it? Extremely well written, but so sad. Glad I could cheer you up. It's a great note isn't it. Thanks, Linda. I know it's February and a little late but it's my way of ringing in the new year. I would love to be walking by your house and see some nut job on the porch yelling "ding dong!" Then I'd realize it was probably Nicky waving her baguette and I'd really see the absurdity in it all! Yeah, "nut job" pretty much describes Nicky. I'm pretty sure Nicky's baguette's aren't fresh anymore. I'm not saying I wouldn't break bread with her. Just commenting on the freshness issue. Yeah, I know. The years haven't been kind to Nicky. She's pretty crusty these days. Better living through higher viscosity! I like it! I also like the second Ding Dong note best. Because you can never go wrong with a good Ding Dong. Um, we are talking about the doorbell and not a small chocolate snack cake, right? But did you install the door answering machine yet? If that baguette line turns out to be euphemism, then I'd be very interested to hear more about this. Also, you should definitely go for the "ding dong" sign. That's just so much more "you", you know?